I know it's early (thanksgiving hasn't even passed yet), but Advent calendars sell out so fast! I remember last year wishing I had one during the first week of December only to see that they were sold out almost everywhere! Avent calendars are a fun way to get into the Christmas spirit and they also make a fun gift (if you're exchanging towards the beginning of december). Advent calendars come in all different sizes and values. I'm pretty sure you can find one to fit anyone you know. Some of my favorites are the beauty advent calendars. Most give you a sample of their product for each day in December leading up to Christmas. It's a great way to try out some products from brands you may have never ventured to before. I love that this comes with a magnetic board with different sweets inside of each container. It would be fun to stick this up next to your desk and watch as Christmas gets closer. 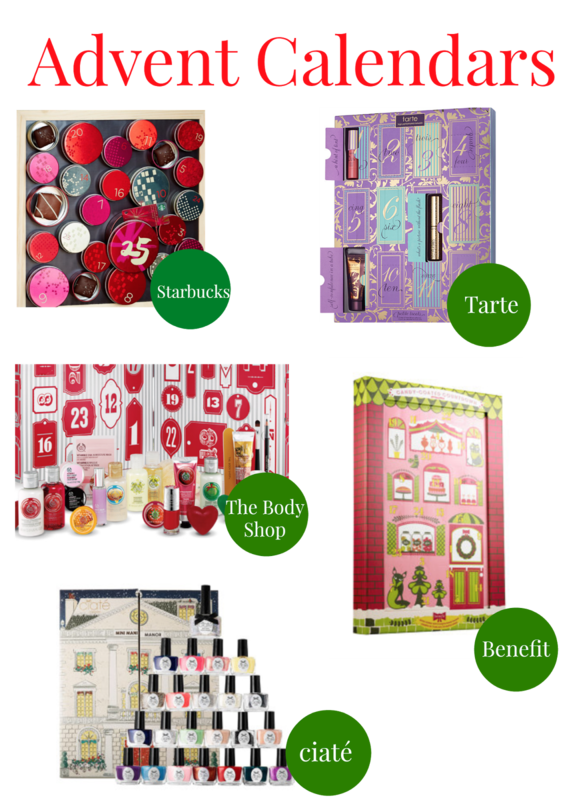 I love Tarte products and this calendar is a great way to get into them. It's fun to open up each door to reveal a new piece of makeup from the brand to use in your everyday routine. In the Winter I really love taking baths, and with this calendar you could have different options for your baths every day in december. There's also a few of there makeup products tucked in. I'm a huge fan of benefit and think that this might be the advent calendar I will be using this year. It comes with a lot of their top-selling items that would be perfect to use over the holiday season, plus a few other extras such as hair ties, sticky notes, etc. I'm a huge fan of nail polish and would love to have a new color each day. This advent calendar is a great way to go out of your comfort zone with nail polish. There's bound to be some colors that you would never normally pick out for yourself, but now that you have it you might as well try it! Do you have any favorite advent calendars?